The team arrived in Talkeetna on March 23 from Anchorage. With a short scenic flight over the Buckskin Glacier and the Ruth Glacier, we are able to check snow and ice conditions on the different faces of the mountains and take pictures to analyze the different possibilities. We finally decided to go for faces over the Buckskin Glacier where we thought we might be able to open new routes on the Mooses Tooth (3150m) and the Bear Tooth (3069m). 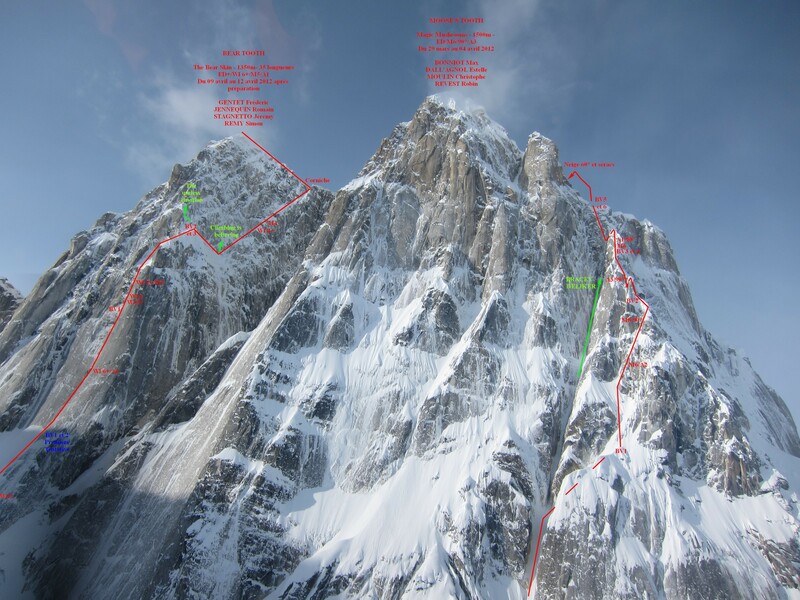 Back in 2006, Christophe had already tried to open a route in the Mooses Tooth without managing to summit. The observation flight was quite an experience since Paul, the pilot of Talkeena Air Taxi, did his best and made me sick... Satisfied, he laughed at me and added a poetic comment..."American breakfast!" Over the following days weather conditions are poor. Paul finally drops us on the glacier on March 26. He is quite surprised (as he was in 2008) by the amount of bread that we are bringing with us to the base camp, forgetting that French people (including climbers) love bread! The first day is dedicated to the installation of the base camp and the second one to an approach to the faces with skis. This gives us the time to precisely observe the faces from the bottom and get a better idea of the challenge. From now on, the team will be divided into two groups Christophe with Estelle, Max and Robin in one team and Jeremy, Romain and Simon with myself. After a final check of their bags, Christophe's team decides to start their climbing on the third day after our arrival at base camp. The climbing will be in pure alpine style since they expect to reach the summit in five days plus one day for the return to base camp. For safety reasons, they will bring an extra day of food, which will prove to be useful since they finally return to base camp after seven days of intense climbing. Wind is blowing on the spur and temperatures are freezing cold (-4 degrees Fahrenheit). During the rest of week, the weather will be partly cloudy with two days of snow. Snow conditions are very different from what can be seen in the Alps: the very typical huge mushrooms of snow really impress the young climbers since it is their first time in this part of the world. The snow sections of the ascent are also much steeper that what you can usually find in Europe where the snow is not sticky enough to stay on faces over 65 degrees. Christophe and his team use the shovel for climbing... Not very typical for Europe but a usefull tool in Alaska. The combination of these amazing conditions contributes to make the ascent unforgettable. However, none of them forget the real dangers of the mountain with avalanches starting under their feet. The climb consists of a steep gully (up to 90 degrees), artificial climbing (A3) and a mixed crux (M6). Sometimes they have to use bolts at the belays. On day five they reach the northeast ridge from where they find a direct view of the summit. It isn't far but a gigantic serac blocks access to the top. They first try to go directly along the ridge but the climbing proves too complicated. Finally Christophe's team decides (after having collectively assessed the situation and the risk) to cross the snow field below the serac and climb to the summit on the other side. In 2008, the Scottish team of Bracey and Heliker had decided to stop their climb at this point. Christophe and his team try to go as fast as they can to stay safe and minimize the risk. Luckily, the crossing is in fact shorter than expected and they reach the summit in deep and fresh snow. The summit push lasted more than seven hours and at the top, everyone started to really enjoy the moment. Everyone was really excited to be there. For their first expedition the young climbers managed to reach the summit in only ten days following our arrival on the glacier. It is Christophe's second time on the peak since he had already reached it from the other side. While Christophe's team returned to the base camp, we were obviously proud of what they just achieved but also eager to start on our own ascent. It was now time to get into our own route, the "Bear Skin" gully. While the other team was on the mountain we had started to climb the first six pitches of thin ice slabs covering a steep rock face. To facilitate the ascent we decided to leave our climbing ropes installed in this section. After these first two long days going back and forth from the base camp to the face we decided to enjoy some rest at the base camp for the next day. The weather was sunny and still very cold when we left the base camp to start the ascent. We hope that we will be able to exit the first gully in three full days. On the second day, we decided to leave our heavy equipment at the bivouac, we know that we had only two days left of good weather forecasted. Therefore we wanted to be as light as possible to try to exit the gully by the end of the day. Around half past midnight in the gully, after eighteen hours of climbing, we sadly had to accept that we would not be able to make it. We were really getting frozen; the technical difficulties were very demanding and climbing at night made any further ascent impossible. We were truly disappointed to be forced to stop in the middle of the line after two bivouacs and 900m of climbing. We therefore returned to the base camp realizing that we will never be able to come back to the Bear Tooth. There are too many runouts, the ice in the gully was severely damaged by the four of us and we had decided to remove the ropes that we'd fixed on the first part. Mike, the meteorologist, was right and four feet of light snow fell in the next two days. We feel much better being in camp rather than in the gully! The snowfall gives us some time to think calmly about was just happened and to recharge our batteries! We take the decision to return, it will be "kiss or kill", the line is really worth it! The next day we leave the camp at 3 a.m. with four days of food. We are so motivated that we are over the first ice slabs by 11:15 a.m. The weather forecast mentioned temperatures around -20 degrees Fahrenheit but unfortunately real temperatures are closer to 35 degrees generating a decomposition of the gully. Now comes another moment of doubt. We wait almost three hours before we can restart climbing. When we get to the bivouac at midnight, we have no room to install our tents. A short and uncomfortable night ensues then we are up at four a.m. to finish the gully. By the end of the day, we finally reach the shoulder, and this will be another emotion of the ascent. While searching for the right location for the bivouac, I start a monster avalanche by breaking a cornice. Not understanding that we were the cause of it, Christophe and his team walk out their tents to enjoy the magnificent view of the snow cloud! For the summit wall we decide to open a new gully which is a very logical diagonal line. To exit the gully, we must make a hole in the cornice with our shovels to reach the final ridge. We still have difficult sections to climb on the ridge and I get a surprise and fall during one them. We need the entire day to reach the summit from the base of the summital wall. When we get to the top, our emotions are intense, the "win" is nice and some of us start to shout! It is now 9.15 p.m. When I spoke with Christophe by radio, he predicted we would arrived at 9 p.m. He was right! After some pictures, it is time to think about the descent. Icing on the cake, we are enjoying a truly emotional moment admiring Northern Lights on our way down. We leave the glacier nineteen days after our arrival. For most of the young climbers, the expedition is now a solid base to prepare future ascents. Some of them are already thinking about going to the South Face of Aconcagua, Patagonia or the Trango towers. Fantastique, je vous f�licite tous pour cette aventure magnifique.